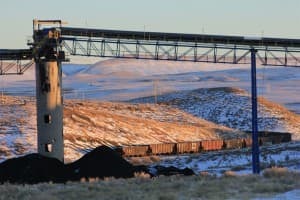 In southern Wyoming, in the path of winds barreling down toward Elk Mountain, weathering tombstones and eroding foundations mark the state’s first coal-mining town, Carbon City. Like its surviving neighbors, Carbon City had a time of glory. It had a newspaper, a state-chartered bank and, at its peak, a population of more than 1,000 people focused on the task of delivering coal to the steam-powered locomotives that passed on the adjacent Union Pacific Railroad tracks. Then, other coal deposits were discovered about 15 miles away, and a new town, Hanna, sprang up. A fire destroyed part of Carbon, then the Union Pacific bypassed Carbon altogether. By early in the 20th century, Carbon was no more. Today, the surviving communities of Medicine Bow and Hanna are trying to avoid the fate of Carbon. 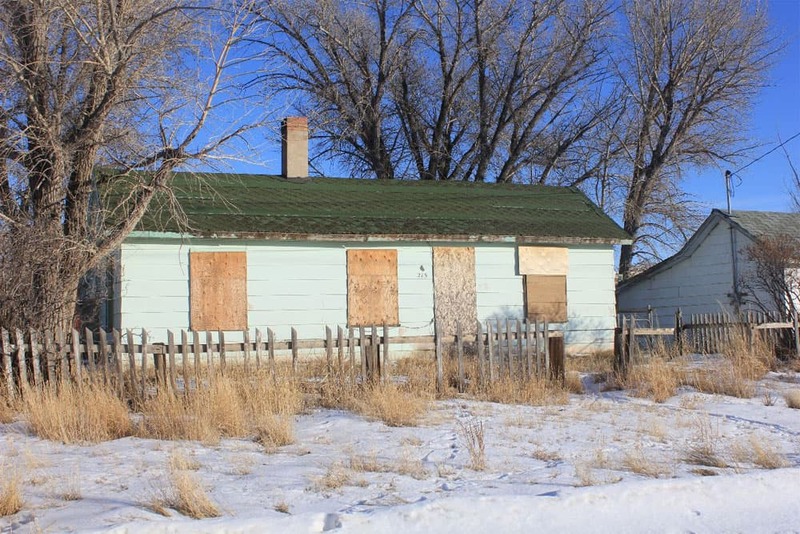 If Medicine Bow recently has been making a minor comeback, the larger story for both has been decades of shedding population and community assets. Many people foresee a time, still fuzzy in the future, when there will be too few people, the economy too thin, to keep going. To them, the proposal by DKRW Advanced Fuels to build a coal-to-gasoline plant offers salvation. School enrollments tell part of the story. 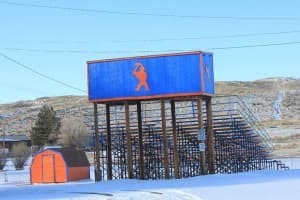 At the peak of the uranium- and coal-fueled boom of the late 1970s and early 1980s, Medicine Bow had a junior-senior high school with 100 students. School teams, known as the Wranglers, were the center of community identity. By tip-off time, the gymnasium was too packed for late-comers. Then, as the boom subsided, so did enrollment. The final senior classes graduated only six students. In the early 1990s, the school was closed, students re-assigned to the school in Hanna, 20 miles to the west. Just last year, the gymnasium, considered a threat to public safety, was razed. Hanna’s schools have struggled, too. In the early 80s, at the peak in coal strip-mining, the seventh-through-12th grade school, where teams are called the Miners, had 200 students. Enrollment has now halved, even with the addition of students from Medicine Bow. Bob Gates, superintendent of the Carbon County School District No. 2, says reduction in enrollment during his six years with the district, which includes the towns of Elk Mountain and Saratoga, has resulted in $1 million less annual state aid. So far, cuts have been made with no clear loss to education or programs, such as football games. This, he recognizes, cannot continue indefinitely. “Is there some point when you can no longer provide meaningful secondary education?” he asks. Medicine Bow may have provided the answer when the graduating class dropped to six or seven, he adds. “We just hope it doesn’t happen here,” he says of Hanna. Hope is a word used frequently these days in Hanna, and in Medicine Bow, too. Unspoken, but just as obvious, is another word: desperation. Sometimes, they’re in the same conversation. “I think most people are really hopeful about this (coal-to-gasoline) plant, because it’s the only way out,” says Gary Jones, a local businessman. Jones, with his wife, Jamie, meet me at a bead shop, a type of retail good usually found in only much larger communities. The further anomaly is that it is Hanna’s only retail store. There’s no lodging, no conventional gas station, no hardware store. Even the grocery store closed last year. For food, residents must drive 40 miles to Rawlins or 70 miles to Laramie. Their shop is located in a long, metal-sided building that in 2001, when the Jones arrived from Tyler, Texas, contained a series of businesses. By then, many of Hanna’s coal mines had closed, but the Jones were persuaded of opportunity. They haven’t been disappointed. They immediately bought a small, dilapidated four-unit apartment building for $18,000, repaired it somewhat, and began collecting rent at $350 a month. During the mini-booms, such as when wind farms have been constructed nearby, the rent goes up. They’ve done all-right. Now, they own five houses. “We saw what other people didn’t see,” says Gary Jones. What the Jones say they found was a peaceful town, small but with a ready social fabric. It resembles an extended family, in that you’re not necessarily close to everybody, but you know them, says Gary. Of course, Hanna has survived tough times before. Hanna essentially replaced Carbon as a source of coal for Union Pacific. Then in 1903, and again in 1908, disasters struck. Three explosions in the underground mines claimed 228 men, leaving 88 widows and 134 fatherless children. Victims were a stew pot of ethnicities, as was Hanna overall. Each had its cluster of homes in the town: Finns, Japanese, Italians Swedes, Greeks, English, and African-Americans, among others. Among the victims was the great-grandfather of Klemola, the town councilman. Born in 1938, Klemola has fond memories. “I couldn’t have been raised in a better environment,” he says. There was a movie theater, a confectionary, and other services. And then, kids made their own entertainment. In 1955, the year he graduated, Hanna won the state’s championship among six-man football teams. Among his classmates was a black student, who went on to become a doctor in Detroit. Then around 1954, Hanna suffered another gut-wrenching punch. Union Pacific converted its fleet to diesel-powered locomotives. The population dwindled to 400 before a new demand for coal in power plants in Idaho and elsewhere spawned new mines, this time above ground, in the 1970s. By 1980, the population had surged to 2,288. But the coal here is more expensive to extract than that of the Powder River Basin. 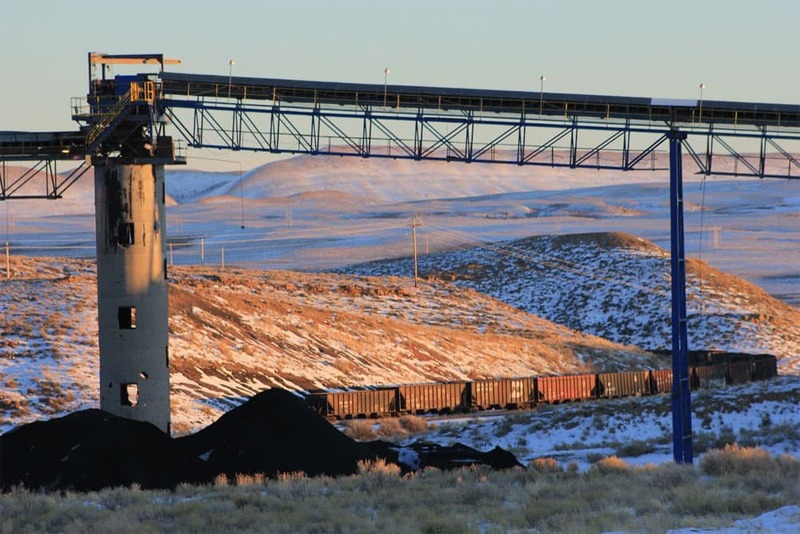 One by one, the mines have closed; the final one, operated by Arch of Wyoming, in December. Locals said they thought 20 to 22 people lost their jobs. An Arch Coal company spokeswoman in St. Louis said six positions had been eliminated. As of the last census, Hanna’s population was down to 841. Up and down, up and down — so it has been in this hardscrabble town amid the desolate, high-desert beauty of southern Wyoming’s rumpled, sagebrush-covered hills. Aspects of Hanna’s zigzagged history are manifested in the physical layout of the town. The original town was owned by Union Pacific, and the miners who lived there were required to buy their groceries in the company-issued script. To escape Union Pacific’s yoke, an alternative settlement, called Elmo, was set up to the east. Between the old nodes are the suburban-style three-bedroom houses built during the strip-mining boom of the 1970s. All of this is on a south-facing hillside above the original Lincoln Highway. The newer Lincoln Highway – today’s U.S. highways 30 and 287 – is about a mile away. Another 11 miles south is Interstate 80. There’s a reason Hanna is peaceful. Hanna today has a sense of looking over its shoulder at better times – and perhaps times that weren’t all that good, either. In the old part of town, Main Street consists of several blocks and no discernible businesses normally found on a street of that title. Instead, it has two churches, one Episcopalian and the other Lutheran, both now closed. If most houses remain used, many are boarded up and lifeless, slowly giving way to the steady winds and desiccating sun. Farther up the hill, to the east, sit several deteriorated structures still wearing siding of brown asphalt roofing material. These houses were created by laying down two railroad box cars on a foundation and then putting a roof over the top. They were, says Jones, the housing for the black miners and their families. Obviously unused for decades, they are slowly being dismantled by the elements and, if local lore is to be believed, home to occasional mountain lions. Deterioration is not restricted to aging housing. While some suburban-style houses are kept up, others look frayed, needing attention. At last count, 19 homes in Hanna were in the process of foreclosure. Brighter spots also exist. In 1980, a coal company built a large recreation center, with racquetball courts, an Olympic-sized swimming pool, and basketball courts. It’s underused today, and maintenance is an albatross on the town government. Town offices are nice, a hand-me-down from a departed coal company. For real-estate buyers, which have included a few retirees, Hanna has some steals. “I had one go to auction a year ago. It was a modest three-bedroom, two-bath with 1,042 square feet. It was sold for $12,000. It probably needed $5,000 of repair work. But there have been some real bargains, that’s for sure,” says Will Speer, a co-owner of Century 21 Cornerstone Realty. The market is sluggish, to say the least. Average selling price is $70,000 to $80,000 for homes that in Rawlins, 40 miles west, would fetch $150,000, says Speer. 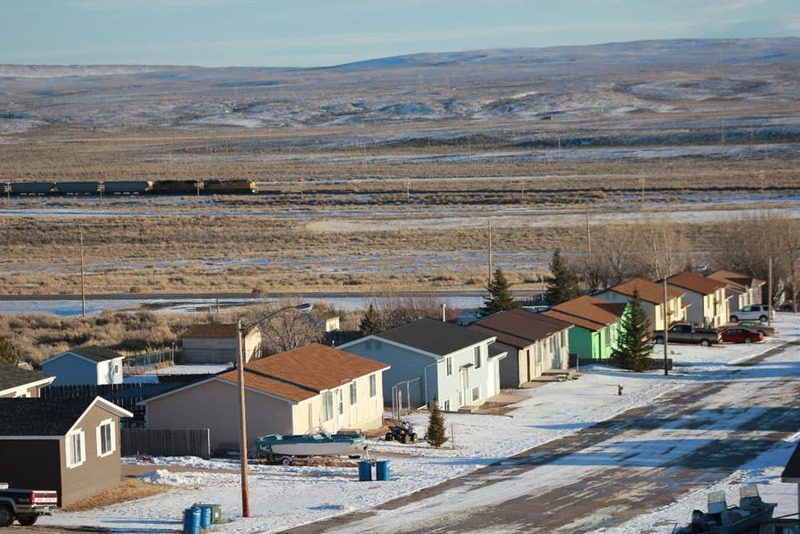 In Rawlins, homes stay on the market an average 186 days compared to 509 days in Hanna. Such statistics breed despair. Among those who hope that DKRW turns the market around is David Dollase. Stooped and bent by what he reports was a hip-replacement that went awry, he feeds deer and foxes drawn by his handouts of bread, and in evening turns out at a local bar, the Nugget, operated by Hanna’s mayor, for a hamburger. “The regular,” he orders. Dollase pines for the mountains of northern California, source of his life’s fondest memories. For that to happen, he needs to sell his house. To sell his house, he needs the new coal plant to happen. “I don’t want to die in Wyoming. Not that I’m all that particular. But it’s a dreadful thought, to die here,” he says. But even those who have no plans to leave, growth would be good. “My hopes are 100 percent,” says Levi Nitschke, 32, while pausing on a street in Hanna during a rare January day of sunshine and no wind. He likes small-town living in Wyoming. “You couldn’t do this in a city,” he says, pausing in his car on a residential street to chat with Jones. But he also sees problems in Hanna. “It’s a poverty mindset,” he says. Gates, the school district superintendent, also has noticed problems. 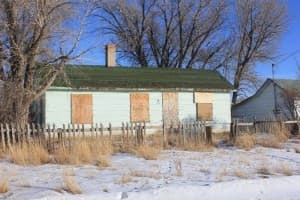 Hanna’s high school was among those in Wyoming singled out under the Obama administration’s persistently underachieving schools, as measured by math and reading scores, plus other criteria. It was, says Gates, “a big slap in the face.” He saw it as an opportunity to get federal money, but also to deliver a message to students and staff. The path for Hanna’s schools remains littered with ifs and maybes, says Gates, but he is encouraged by the initial response. Local high school students said they see the need to do well for others. “When high school kids talk like that, it’s definitely a step in the right direction,” he says. “We’re not there yet, but those kids took ownership” by recognizing they could help turn their school around. 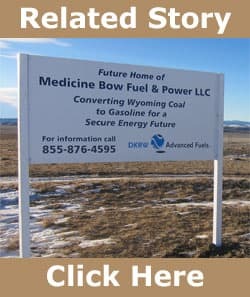 If the coal-to-gasoline plant does get built, enrollment losses in the Hanna and Medicine Bow schools of recent years will be erased – but not the large losses since the last boom. DKRW has projected 2,215 jobs during the construction phase, then a few more than 400 jobs in operations. That translates to 25 to 50 new students spread among the elementary schools in Medicine Bow, Elk Mountain and Hanna, as well as the secondary school in Hanna. People, he observes, can also commute to other, more distant communities. Tony Poulos, the mayor, reports a hopeful but wait-and-see attitude for a proposal that has been hanging around for several years. “We want to see that it’s real before we invest time and money and whatever else,” he says. Some people would like Poulos and Hanna to become more of a cheerleader for the coal-to-gasoline plant. Based strictly on track-records, Poulos is right to be skeptical. The plant was first scheduled to break ground in 2009. It didn’t happen. The federal government – and state, too – have seeded the Two Elk coal plant 40 miles southeast of Gillette. Two Elk’s chief executive may be living well in his homes in Denver and Southern California, but there’s no evidence of forward movement in Wyoming. Last year, General Electric abandoned its improved coal-gasification demonstration project near Cheyenne. And finally this big rain-on-the-parade fact: Nobody else in the United States is making gasoline from coal, despite the fact that the technology has existed since World War II. This is despite the ever-continuing pronouncements by corporations and politicians alike since the early 1970s of the need for “energy independence.” At the time, Poulos, 55, was still in high school. 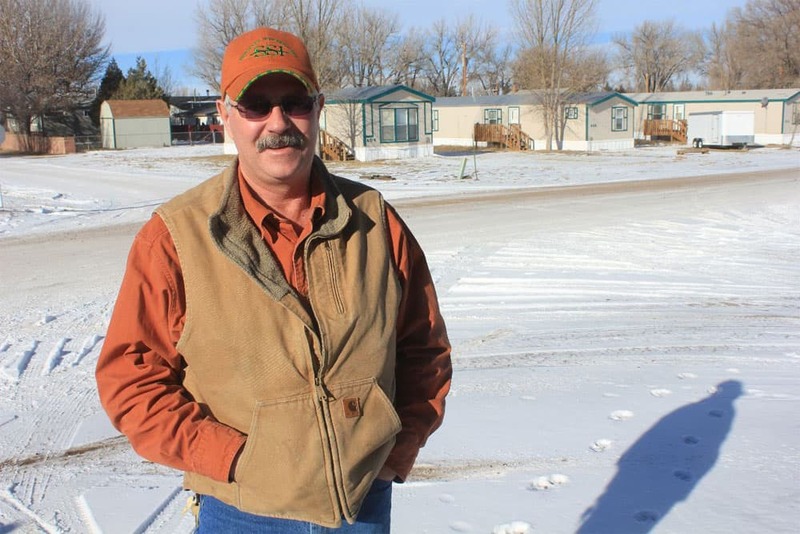 Twenty miles east, Medicine Bow, population 270, has shovel-ready plans for improvements to water, sewer emergency services and other infrastructure needs. But it, too, awaits clear direction – and money. Unlike Hanna, George reports conversations with not only DKRW representatives but also subcontractors and out-of-state people, and a sense that this is finally the year. Medicine Bow is located 11 miles from the proposed plant site. Medicine Bow – despite some dissent within the community – has clearly articulated wishes to have the plant. Being closest to the proposed plant, they expect to see the most significant impact. The town boomed with uranium mining to its north, and has briefly boomed with the construction of wind farms. Antelope-hunting season is always busy, and summers can be lively. But winters are very, very quiet save for the almost constant, bitterly cold winds that rake the prairie. With the coal-to-gasoline plant, Medicine Bow leaders see a way to create a new steadiness in the economy for the next 30, 40 or 50 years. “A lot of them would like to skip the construction part, but that’s not the way it works,” says Troy Maddox, a retired state trooper who now butchers game and herd animals at Maddox Meat Processing. 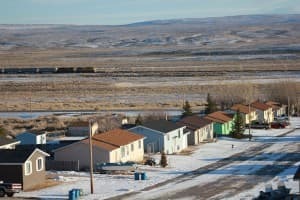 “We have a portion of the town that wants nothing, because they will lose their $100 a month rents, so they couldn’t just smoke their dope and drink their beer and do nothing,” Maddox continues. Older people who own their homes will survive a boom just fine, he thinks. Elderly who are renting will get pinched, though. But of the need, he has no doubts. Wyoming, he says, has been protectively hoarding its rainy-day fund. It is, he says, raining now. At Medicine Bow’s landmark Virginian Hotel, co-owner Vernon Scott firmly supports the coal plant. “We haven’t had anything down here for 30 years,” he says. A native of the area, with roots to 1888, he’d like to see the town grow – just enough. His own children, all college-educated, have skittered to other communities. The perfect small town? It would be 2,000 to 3,000 people, he says, which is big enough for schools and other core assets, but not so big you couldn’t know most people. 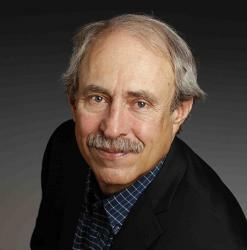 Allen Best is a long-time journalist based in Colorado. He can be found at http://mountaintownnews.net. Ummm the Hanna Rec center was not started till 1983 and finished in 1984 so how was it built in 1980???? I know for a fact the Hanna Rec Center was not here in 1980 or earlier because I lived here at that time and there was no Rec Center at that time. My parents had the game room behind the Side bar until 1980. I live in Medicine Bow, WY and have for the past thirty-six years. This town may be small but it is not dead and it is not near death. Our Town has been around for over 100 years and has always been a small Wyoming Town. We were here before DKRW and we will be here long after DKRW is gone. It is interesting to me that this article was written without speaking to anyone in the Town Government giving comment. I would think that an author would want to talk to more than just three people before he declares it to be a dying, dead town heading down the historical path of the old town of Carbon. Have been trying to find some of the old group from Fort Collins High School. Thought you still might be in Medicine Bow, but didn’t know your e-mail address, if you have one. Just wanted to let you know (if you don’t know already) that Diana Borthwick has passed away. She is the first, I think of our “group” to leave us. If you want to respond to me, my current e-mail is sjroberts1111@gmail.com. PS — loved your defense of your home. You can be a tiger! Here’s an idea.Get rid of your public works director.Communities all over the state went for decades without public works directors and prospered.There’s no excuse for these small towns like hanna to have a public works director or any other sit around administrative positions.Mayor and council can cover administrative duties. Coal to liquids is not going to happen. There is no viable water source. Pennsylvania had $300 million in federal money,unlimited water sources and railhead transportation,yet still couldn’t get a coal to liquids plant up and running.Wake up!!! Boom ‘n bust, boom ‘n bust. That’s the history of these small towns. Whether DKRW provides a long-term future remains to be seen. Conversion of coal into liquid fuel just ain’t gonna happen without massive subsidies. Given the politics and economics of today and tomorrow, it seems like an iffy bet.